With March 20th quickly approaching it is time to start revamping your backyard room to get ready for the next season, Spring. Whether your backyard still looks like a winter wonderland or you are starting to see flowers bloom; these three simple tips will ensure your backyard room will be ready for all the festivities you have in store for the rest of the year. This doesn’t have to apply to all of your décor, but spring is a great time to take inventory of your outdoor furniture. Depending on how harsh your winter may have been this could be really simple or time consuming, either way it will be worth it in the end. When going through your furniture it is important to decide what still looks good, items worth saving or if it’s time to say goodbye. Don’t forget there is always the option of refurbishing old items and turning them into something completely new. Think clean clean clean. Changing up your backyard furniture isn't the only element that will get your backyard room ready for Spring. To really make the most of those sunshiny days it will be beneficial to freshen up your backyard room with the addition of some blossoming flowers. Before spring is officially here it is a good idea to assess the areas of your garden that were damaged by the harsh winter and start adding new additions. Depending on what part of the world you reside in there are certain plants that grow better than others, so take the time to find out which plants will thrive best in your environment. Depending on the size of your backyard room you can really make a statement with your garden or use it for both functionallity and décor purposes. 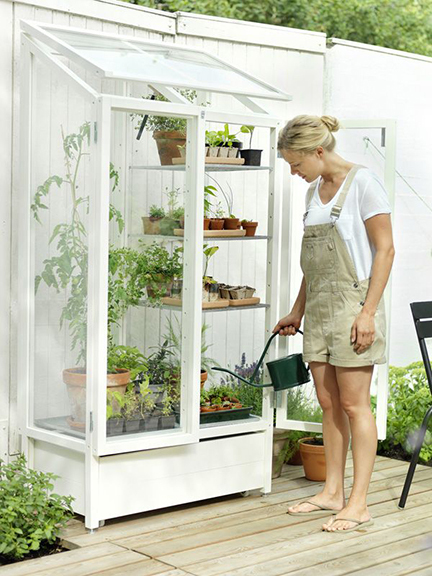 Making use of your own green house ensures that your plants are safe year round from intense weather conditions. 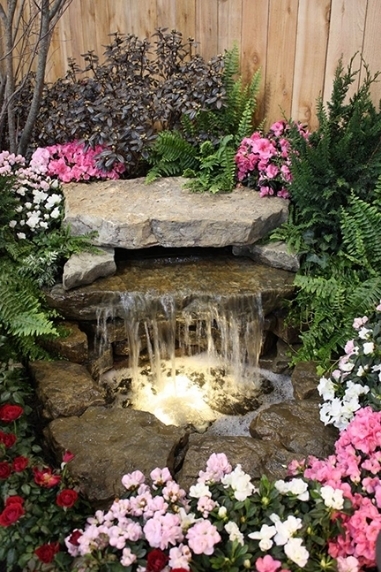 A personal garden area can also be put to great use if you don't have a backyard large enough to plant your own garden. Keeping your garden green and healthy can be difficult during the winter months, so preparing for spring with regrowth of new plants and pruning old plants will make your backyard room ready for the months to come. Seeing the same backyard layout day after day can start to get old. You can easily freshen things up by simply re-arranging your furniture. There are certain areas, for obvious reasons, that will not be able to be arranged differently, but the simple act of just rotating the lawn furniture a different direction can make a difference. Loose backyard furniture makes it easy to shift around your backyard layout with the PowerPool as the central eye catching feature. Image as seen in the PowerPool by MAAX Spas brochure. Another great way to freshen up the look and feel of your backyard room is with the addition of intricate designs in your fencing or walls. Often times people overlook fences or walls in their backyard and don't even think of them as art, but essentially fences are just another form of wall available to design as you please. The look and feel of this architectural design really freshens up the living space and makes for a more interesting backyard room. Image as seen on houzz.com courtesy of Michelle Walker architects. Even if it isn't quite warm enough to enjoy your backyard room; spicing up your furniture, sprucing up your garden and updating your space will really get you in the mood for Spring. These simple updates and additions will set your backyard room apart from others and become an area for enjoyment for yourself as well as your guests year round.